Success In Music: Is It All Down To Mindset? During my early teaching career, there was one extracurricular activity that I never missed and that was our annual State Music Camp. I loved it! It was a buzz for me to attend as a teacher for many years, the kids were stoked to be there, some great conductors gave their time and energy freely and the kids worked hard while having lots of fun along the way. We all learned such a lot together! I remember looking around on the first couple of days over the years and noticing the children attending. Some of these children had travelled 15 hours from the outback just to be there, others had travelled five minutes down the road. There was a diverse range of backgrounds sitting in one room all with very different life experiences. Yet there never seemed to be any of those “child musical prodigies” or seemingly “naturally talented” children out of all of the hundreds sitting there. I remember thinking to myself “Where are they?”. But…they never seemed to be there at this music camp….during the school holidays….in the middle of winter. I remember thinking to myself….are they too busy to be here? Are they too “good” for it? I wonder if there are any other teachers out there who feel like I did? How many teachers find that their more “naturally talented” students just didn’t bother turning up one day, even when they had the chance to do something really special, they never put themselves in a position of trying something new and eventually (dare I say it) …drop out! 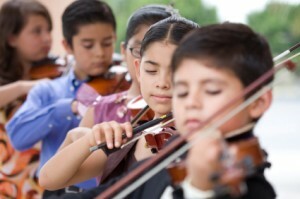 After years of suspecting that students who are seen as the more “naturally talented” early on are at more risk of not succeeding, not just with music, but also in life; a recent (January 1st, 2015) article published in the Scientific American confirms this to be true and gives some researched, insightful tips to help parents and teachers . The first being a “fixed” mindset . This is where people believe that they are born with a certain amount of intelligence and that won’t change throughout their life. They found that often a person who thought they had talent or intelligence did not need to work hard to do well and that they thought that having to work hard at something was a sign of low-ability. The other type is a “growth” mindset. These people believe that the more you work at something, the better you become at it. Often people with a growth mind-set who have a setback in their test or study results, find new ways or strategies to master the materials. In a “nutshell”, the advice Dr Dweck gives in her article is don’t tell your kids they’re smart! Parents and teachers need to focus on the process of learning rather than the intelligence or ability of each child. Tell your students about achievements that resulted from hard work. Tell stories of great mathematicians,musicians and scientists who fell in love with their subject and developed amazing skills. Be careful how you encourage your students. Statements like “Wow-That’s a really good score. You must have worked really hard on that” encourages a growth mind-set rather than “Wow -that’s a really good score. You must be smart at this” which encourages fixed-mindset. Educate your students on what mind-set is and how this can help them with their study habits. Read articles such as “You can grow your Brain” together as a class or study interactive computer modules such as Brainology to help raise awareness and understanding with your students. But now I want to hear from you. With this information in mind, what are some of the ways you encourage growth mindset in your music classes? Please go ahead and fill in the comments box below to share your ideas and experiences together with the wider music teaching community. You have definitely nailed it! I taught in the school system for 31 years, and I would definitely rather have had a student who worked hard vs. one who didn’t since it came naturally to them. Our challenge at every grade level was trying to find activities that would still motivate the ones that things came easy for them. If that wasn’t achieved, poor behaviour started to show through, and yes, they tended to leave school earlier. I have never seen an article related to music and the difference in mindset, so I really appreciate it! I currently teach piano and violin students, and you are quite right. If they don’t work at it, they don’t last long. I still believe hard work and a growth mindset pays off in the long run. Not only in music and school, but life in general. You have hit the nail on the head. The majority of children and adults I meet today in the public school setting are stuck in a fixed mind set and afraid to grow by trying. Very few of us have “The Voice” and even young children are intimidated by that standard when they hear their own untrained sound. I am continually battling against an unrealistic standard. Further, because their natural voices sound so contrary to the “standard” they are unmotivated to bloom what has been planted in them. Oh for the days, when ordinary people sang because it was fun and not because it might make them a star. What an enlightening article! I suddenly understand some of my students so much better. Thank you for posting it. As I look back, I can see the exact scenario you talk about. One of my best,”smartest” students waited until the last minute to practice a piece for a recital. I kept reminding him of the time he had left and he would tell me not to worry he would have it. I’m sure he thought he would, and so did I, because he was so “smart” and everyone, including me told him he was. Unfortunately, he wasn’t able to learn his piece very well in the limited time he had and his performance was very disappointing to him, me, the audience and especially his parents. When I asked him how he felt about the whole thing, he said he realized that some things take more time to learn than others and he wished he had done better.